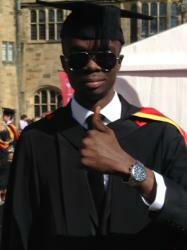 Eta Uso from Nigeria emerged as Best Graduating Student by achieving the highest overall marks for all students who were taking the MSc Computing & Internet Systems programme at Bangor University’s School of Computer Science. Thrilled by his achievement, Eta said: "Coming from Africa, Nigeria to be precise, I did not know what to expect in terms of academics at Bangor University. The only things I was sure of, were that Bangor is a small and quite city where everyone knows everyone and also that my intended course of study was going to put me under the tutelage of the best hands of Professor Jianming Tang and renowned Artificial Intelligence and Intelligent Agents researcher, Dr William J Teahan. "Arriving in Bangor was not only my first time in Bangor, but also my first time in the United Kingdom. However, I had researched so much about the city of Bangor months before my arrival, thus what I saw and experienced on arrival was just what I expected. I quickly joined the Afro Caribbean Society of which I later became the Public Relations Officer for the organisation. "My first week in class was interesting, in that I felt a bit lost. However, that just lasted a week and I was fully relaxed by the next. Assessments and Course Works came and I just kept scoring them one after the other with very high grades. "One interesting thing that comes to mind when I think about my time in Bangor University, is that, the two renowned lecturers whom I read about and was inspired to come to Bangor, actually did play a major role in my life story at Bangor University. First, Professor Jianming Tang taught the 'Networking and the Internet' course in my first semester and I achieved not only 97% in the main exams but also the highest overall mark for the module. Also, Dr William J Teahan, of whom I admired his deep passion for research in Intelligent Agents, also ended up being my Project Supervisor. I also achieved a Distinction in his taught module. "I must also acknowledge Julie Boulton, the Prograduate & Timetable Administrator for the School of Electrical Electronic & Computer Science. She made my early weeks at Bangor University really comfortable as she always had a ready ear to the issues and problems faced by the students. "Most importantly, my life in Bangor will not have been very easy without the love and ever present care of my family. The kind and powerfully encouraging words of my dad, to the 'it is possible' encouragements from my mum and then the ever 'yes you can' words from my siblings were all the moral boosters I needed. "I currently work in Abuja, the capital of my country, Nigeria and I am really thankful for the knowledge and exposure I gained at Bangor University. I believe that in the not so distant future, I may be reopening another chapter of my life in Bangor University with a pursuit of a PhD."